UCD undergrad Rebecca Koch studied whether “swish” feather sounds are important for mate choice in sage-grouse. 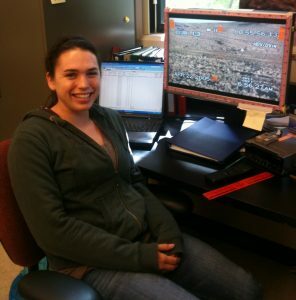 Becca earned a PhD at Auburn Univ and is now a postdoc at Monash Univ in Australia. Click the image to visit Becca’s homepage. 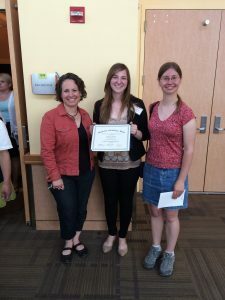 Grad student Allison Injaian with two of her undergraduate field interns. Undergrads helped to check growth of nestling tree swallows at a field site near Putah Creek. 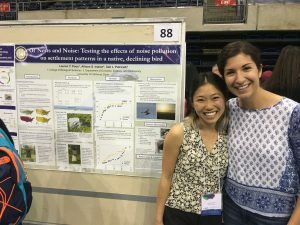 This was part of Allison’s PhD project studying the impact of noise pollution on territory choice, nestling growth, and parental behavior in tree swallows. Click the image to visit Alli’s homepage. Undergraduates play a critical role in the Patricelli Lab! More than 300 undergrads have worked in the Patricelli Lab under the mentorship of Professor Patricelli, Dr. Krakauer, postdocs, and/or graduate students. Undergrads typically earn research credit (EVE099/EVE189) or transcript notation for their work. 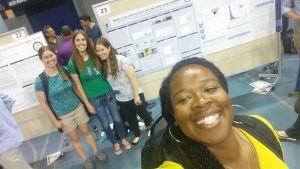 Some of these student researchers participate in local field projects and others conduct their work on campus in the lab. As part of our work on sage-grouse behavior and conservation, we collect 100s of hours of audio and video data each season, which we analyze with the help of undergraduate researchers. This kind of work is very time and data intensive, and it would be impossible without the help of undergrads. Many of our former lab interns have gone on to graduate and professional schools. We encourage our undergrad lab members to participate in lab meetings, where we discuss ongoing research in the lab and current literature. We work with interested and motivated underads to develop more independent and in-depth research projects, which may be part of an honors thesis or practicum. Many of these students have presented their independent research at the UC Davis Undergraduate Research Conference, or at national or international meetings (see pictures of undergrad presenters below). So far, fifteen UC Davis undergraduates have been co-authors on peer-reviewed scientific publications. If you are interested in working in the lab, please email Professor Patricelli and ask whether there are any openings. We have students working in the lab over the summer and throughout the academic year. Why do undergrad research? There are lots and lots of reasons to do research as an undergraduate. Research experience is essential to getting into top graduate programs for Masters or PhD degrees; it’s easier to get this experience while you’re an undergrad than after you graduate (though there are opportunities for graduates as well, as discussed below). Research experience can also help your application stand out for a professional school (e.g. medical, vet, dental, or law school) or any job in the sciences. It shows a willingness and motivation to seek learning opportunities beyond the requirements of your degree. Many jobs and grad programs require letters of recommendation; these letters will be much stronger if they are written by professors who know you through your research in their lab, rather than professors who only know you from classes. Working in a lab will also teach you research skills and techniques that will be helpful in almost any job you do — this includes lab or field skills, like PCR or vegetation transects, but also scientific writing, data management and analysis, time management, teamwork, reading scientific papers, developing hypotheses, designing experiments, etc. 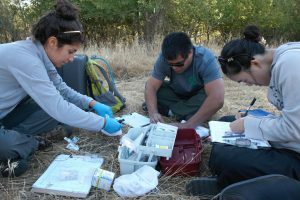 The opportunity to take part in cutting-edge research is one of the biggest perks of attending a research university like UC Davis, and UCD is one of the top schools in the country in the biological sciences, especially ecology, evolution and behavior. So take advantage of the opportunity. It’s also fun! 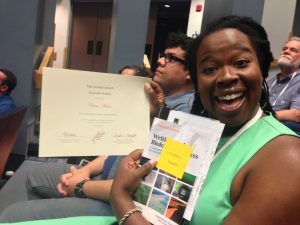 If you’re excited about research and looking for a place to geek out about science with others, then joining a lab can connect you with fellow motivated undergrads, as well as grad students, postdocs and professors. These people can talk to you about careers, grad school, life as a scientist, etc. For many students who truly engage in their undergrad research, their lab becomes like a family on campus. 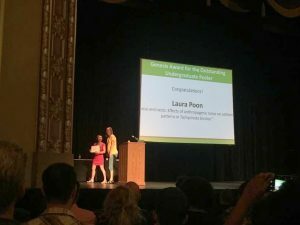 Can I paid for undergrad research? Most undergraduates sign up to receive academic credit for doing research; ask the advisor for your major how many credits will count toward your major requirements (for UCD Evolution, Ecology and Biodiversity majors, 4 credits of 192/198/199 will count toward your upper division bio sci electives requirement). Consider these credits well spent toward your science education and your career preparation. For students who cannot spare the time or credits for research, there are some options. Students who qualify for work-study may use it to support work in some labs (ask the professor if this is possible in your lab of choice). In some labs, there may also be paid positions during the summer or academic year; some students may continue to work as a paid technician in their lab for a while after they graduate. You can ask professors about possible paid internships in their lab, or search for them on Aggie Job Link (or the other internships listings given below). But not all labs have funding to pay their undergraduate interns. If your financial situation is preventing you from seeking research opportunities, there are a number of excellent programs and fellowships on campus that can help. When is the best time to start undergrad research? If you’re serious about research, I recommend finding a lab in your sophomore year. Starting early is especially important if you’re interested in an independent project, honors thesis, or practicum, as it will give you time to learn the ropes before you decide on a project. Like many labs, Patricelli Lab undergrads usually begin with the easier lab projects and work their way up to independent projects if they’ve demonstrated scientific curiosity, commitment and willingness to work hard. This all takes time, so don’t wait until your senior year to get started. But if you’re already a junior or even a senior, then it’s not too late to try! Many labs may still have opportunities for you. You should also consider undergrad research even if you’re not interested in doing an independent project — you can still benefit from experience in a lab. 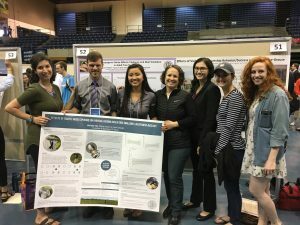 If you’re unable to get enough research experience during your undergrad degree, or just want more, there are opportunities for recent graduates as well: some UCD graduates get positions in labs on campus, there are also off-campus research positions in many fields (here are a few listserves for volunteer or paid positions in wildlife biology, bird research, animal behavior research, or ecology; with some Googling, you can find a listserve or job posting site for almost every field of study). The best way to get into a lab is to talk to your professors during office hours — ask them about their work and opportunities in their lab. Even if they don’t have openings, they may know of colleagues who do. Don’t be intimidated about talking to your profs — most professors are much nicer than you may expect, especially if you’re asking them about their research! The worst that can happen is that they say there are no openings in their lab. Your teaching assistants are also an excellent resource. TAs are typically PhD students or Masters students in a lab on campus, and they likely have an active research project. They might be looking for good undergrads to help them out, or they may know of labmates or friends who are looking. You can also look through the list of faculty in different departments, then email professors whose research looks interesting. If you do that, I suggest that you introduce yourself and tell them about your interests and experience, and why you’re interested in their lab in particular; then ask if they have any openings you can apply to. Remember that many professors get 50+ emails a day, so you may not get a quick reply. If you don’t hear back in a week or two, send a polite follow up email. Your message is more likely to stand out if it’s specific to the lab and personal, rather than a mass email. You may need to send these emails to quite a few profs before you find an opening, so don’t be discouraged. Make use of campus resources: The UCD Undergraduate Research Center has information and listings for open labs, and excellent programs to support under-represented, economically-disadvantaged, and first-generation students seeking research experience. The Internship and Career Center also has info for interested students, including a list of internships on Aggie Job Link. The College of Biological Sciences also has excellent information and programs for CBS students seeking research opportunities. There is also UCD funding available to support the costs of undergrad research and travel to conferences or research sites.